This entry was posted on February 11, 2016 by DreamDay. The perfect bridal veil can complement the perfect wedding dress. This week we look at the various wedding veil styles that brides have chosen in the past along with some great bridal veil styles and inspirations that may be perfect for you. For many brides, putting on the veil completes the entire look and is the final touch to the whole ensemble. Deciding on a veil style can be as important as picking out the perfect wedding dress. Firstly, why is a veil worn? It’s a traditional custom that originated in Europe. It is also considered a reference to the bride’s innocence and is often worn by first time brides. The lifting of the veil can be done in two instances; either where the father lifts the veil and present his daughter to the groom, or when the groom lifts the veil symbolically referring to the consummation of the marriage. Whilst bridal veils are still very popular, the way you accessorise them is up to your personal style. You can use floral or diamante crowns and even jewelled hair accessories to complete your look. Here are the most popular bridal veil styles! 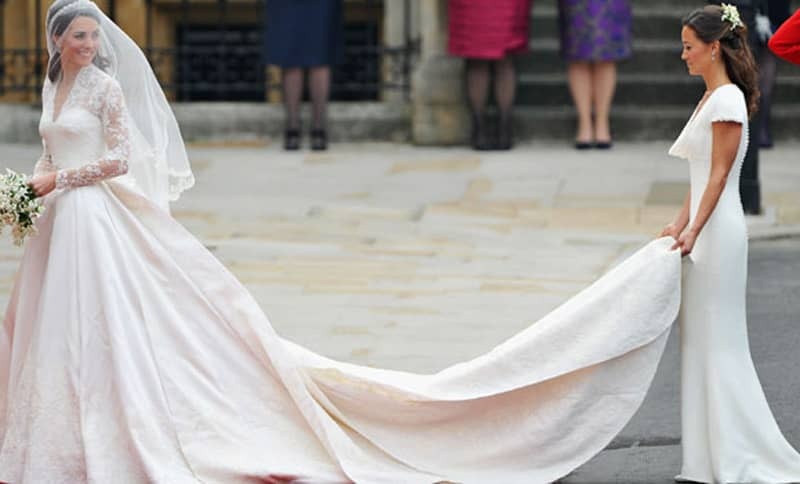 The most regal of bridal veils and often worn by monarchs, a cathedral veil is traditionally 120cm in length but can be longer. The most traditional of bridal veil styles it complements traditional wedding dresses that also have trains. Cathedral veils are also worn with a blusher veil that matches the design and is usually mid length compared to the height of the bride. The chapel veil is slightly shorter than the cathedral veil where it is often the same length or slightly longer than the brides’ wedding dress. Similarly, the chapel veil can be worn with a blusher veil. The chapel veils are chosen for its elegant and sophistication. You can either opt to have an embellished edge especially if you have chosen lace or opt for the simplistic design of the fabric you have chosen (such as tulle). The fingertip veil draws its name from the fact that its length is measured from the bride’s head to her fingertip. It can be worn in various ways and accessories, and not to mention trimmed with embellishments or simply left as is with a trimmed hem. It’s an ideal choice for brides who want to opt out of the long length but still carry off the elegance of a beautiful veil. This type of veil carries a vintage look and it is ideal for brides who would rather not wear a veil longer than their shoulders. Made from netting, the length of the birdcage veil can vary between either covering the nose or the chin. There are many ways to wear with veil such as from the front or the side and adding embellishments and accessories is recommended too. Many brides love opting for a birdcage veil especially if they are fond of 1920s style! A blusher veil is what the bride will wear to cover her face while walking down the aisle. In terms of length, it usually reaches the bride’s elbows but you can also opt for a shorter style at shoulder length too. The bride can choose to either wear only a blusher veil or couple it with a cathedral or chapel veil. The drop veil is one of the easiest to wear and remove as well, as it is a circular fabric that can be embellished if you wish. It is simply draped over the bride’s head and you need not use a hair comb to fix it to your hair. However, you can style it with a jewelled headband or crown or even a floral crown. Princess Grace and Kate Middleton both wore drop veils. The now Duchess of Cambridge wore it over her crown by fixing it to its back so that when lifted it was still secured (and would not fly away).